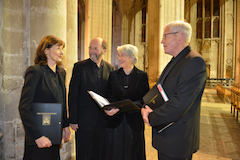 Applications to join the Waynflete Singers are welcomed from all competent singers, particularly tenors and basses, with sight-reading ability and a good clear voice. 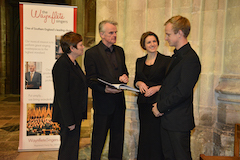 Admission is by brief audition with our Music Director, Andrew Lumsden. Applicants are asked to sing a simple prepared piece of their own choice. In addition, they are given aural tests and accompanied sight-reading, usually of an extract from a standard choral work. 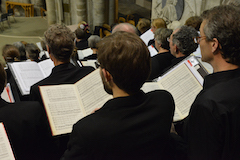 Members are expected to sing in most, if not all, concerts and to attend rehearsals each Thursday night at 7:30. Rehearsals are mostly held at the United Church in Jewry Street, Winchester. The next round of auditions will be held on Tuesday, 2 October 2018 . Please send any enquiries and applications to our Secretary, Kate Spencer via our contact page. The closing date for applications will be 29 September. We are pleased to be able to offer a number of subsidised places for student members. Please contact us for further information. This is your quick guide to what it's like singing with The Waynflete Singers, the thoughts of our conductor, Andrew Lumsden, and how it feels to be one of us. Please send any enquiries and applications to our Secretary, Kate Spencer via our contacts page.